There are few things that I hate more than riding in the rain. In fact, often when I get caught in the rain, I try to determine if there is actually anything I hate more. I do not like the sound or feel of Styrofoam (think nails on a chalkboard) but since so many wines are delivered in styro, I have learned to cope. I also don’t particularly like mowing the lawn, but I live in the city—we don’t have a lawn. Then there are fools, which I do not suffer easily, but I can’t say that I hate them. Ergo, I am pretty sure that riding in the rain is just about the only thing I can say I actively hate. A couple of weeks ago, while I was leading a bike trip in Champagne, we actually had very good weather: a lot of sun, but not too hot with cool, even chilly evenings. Perfect for riding. On the first day we were to ride through the vineyards in the Vallée de la Marne in Champagne, however, the skies were at best ominous, on the verge of threatening. When this happens while I am leading a trip, there is usually only one choice. The day’s route even began with a train ride as part of the route, thus encouraging me to just stay on the train and cruise into Epernay instead of trying to ride in between the drops and stay dry. On the other hand, once getting into the vineyards, the ride is a magical voyage among the vines, in and out of tiny villages all making the elixir that drives me. I guess I could risk getting wet. After all, it was not my bike. It was also a day that we would pass by the statue of Urban II, pope during the Middle Ages, who was born in the village of Châtillon. I am by no means a religious fanatic, but Urban was instrumental in the advancement of the Champagne region through his policies, well at least indirectly. As a result of his work as pope, the vineyards in Champagne were expanded and “modernized” in order to increase production. Oh yeah, that “policy” was calling for the first Crusade. Many of the nobles had to expand their vineyards to pay for their participation in the slaying of the infidel. The lands of those who were not lucky enough to return were often handed over to the monasteries in the region who, in turn, codified and modernized the grape growing and wine production practices. Sure, countless people died and the Middle East has had a fervent hatred for the West ever since, but it helped in the evolution of the world’s greatest wine. Silver lining people, silver lining. 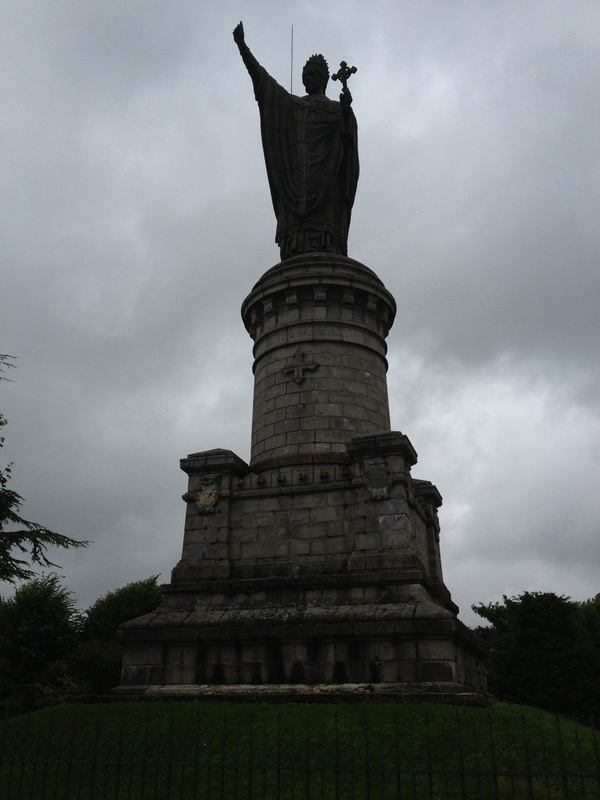 After climbing up the incredibly steep hill to reach the statue and snap a few pictures, I came down the hill in a driving rain. Actually, there is one thing I hate more than riding in the rain: riding my bike downhill in the rain. A couple of weeks earlier, my friend asked me if I could recommend a producer in one of the smaller villages on the approach into Epernay. I did a bit of research and I came up with Collard-Chardelle. The wine is not available in the U.S. and I had never tried their wines, but I was fairly confident that it should be pretty good. Call it a “spidey” sense. Or you could call it a “Richard Juhlin, the preeminent authority on champagne liked it so I should too” sense. After pedaling around the village for a few minutes trying to find the place (technically I am a “Tour Guide” but after years of denying it, I finally admit that I have a terrible sense of direction), the two with me were a bit dubious that I knew much about Champagne, let alone where the actual winery was. Finally, I found it. It was rather non-descript from the outside; it looked like somebody’s house. After a long minute, a silver haired man came out from what appeared to be the garage. I explained to him that we would love to do a tasting, if he were available. He seemed a bit stressed as he looked at his watch and then explained that he had a rendez-vous soon, so it would need to be a quick tasting. 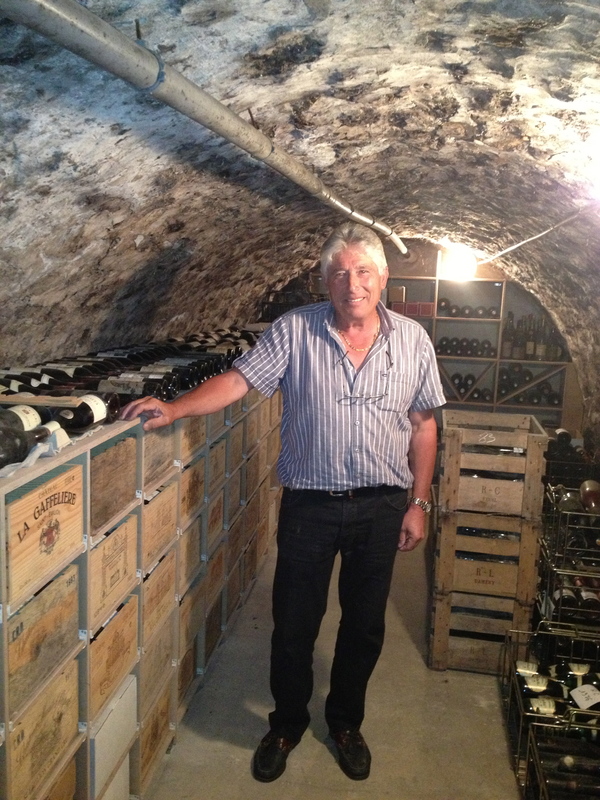 After I assured him that any time he had would be wonderful on our end, he welcomed us in to his “tasting room”. We left close to two hours later. He escorted us into the living room/tasting room/office area and grabbed a few bottles for us to taste. It took some time to explain to him (he only spoke French) that one of the two clients with me did not drink alcohol at all (she lacks the enzyme to break down the alcohol [this is actually not technically correct, but I digress]). He really had a difficult time understanding why she did not even want a small taste. After tasting his wines, I understood completely. 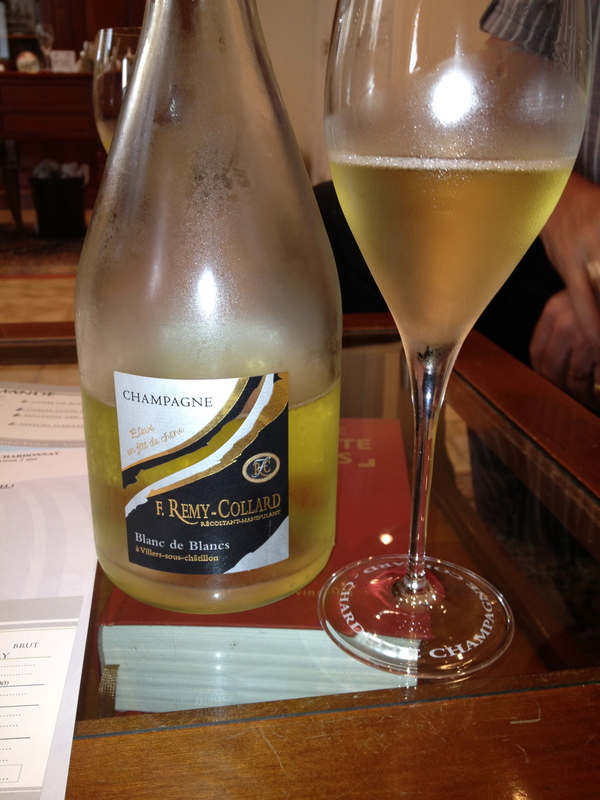 We then moved on to his N.V. Blanc de Blancs (most champagnes are made from the clear juice of two black grapes–Pinot Noir and Pinot Meunier–and one white grape–Chardonnay–the Blanc de Blancs is made with 100% Chardonnay). Blanc de Blancs are usually described by their “finesse” or “elegance” since that is generally what Chardonnay adds to champagne. I, for one, am not usually a fan of Blanc de Blancs (BdB) since I relish in the backbone and power that comes from the Pinot Noir. This wine, however, was my kind of BdB since the time in oak clearly added a depth of flavor, while keeping the finesse. Outstanding. 92-94 Points. I mentioned to him that I had tried his top wine, the 2002 Saveurs d’Antan just a few days earlier with the aforementioned good friend back in Paris. He quickly asked if we would also like to try it now. We had just met, so I did not reply “Duh!” but I was surely thinking it…. He said it needed a brief “frappe” in the ice bucket, so he offered to take us on a tour of the facility in the interim. We quickly agreed and it was very impressive despite their tiny production. 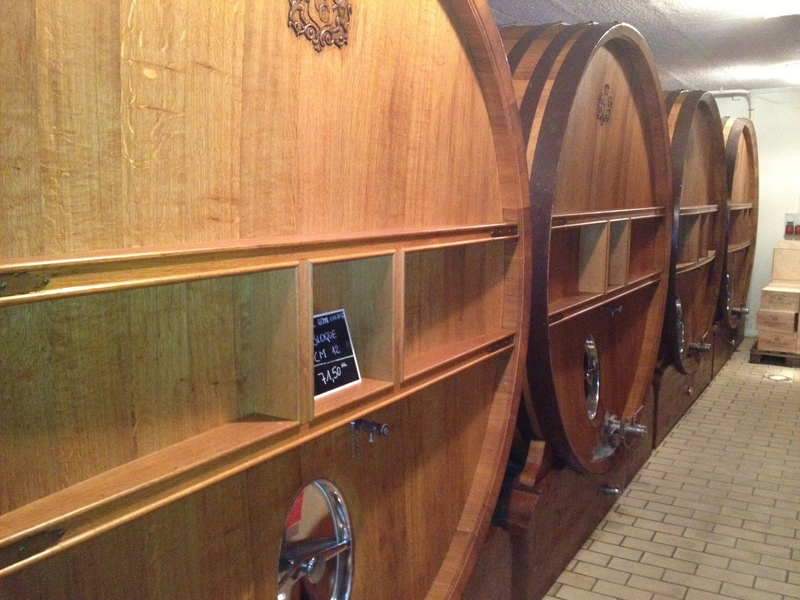 He explained, as he showed us his magnificent oak barrels, that he was one of the few producers to still age his wines in oak barrels, which was the practice for all producers of champagne before the advent of the stainless steel tank. He elaborated that the stainless steel was attractive since it was much more predictable and controllable. 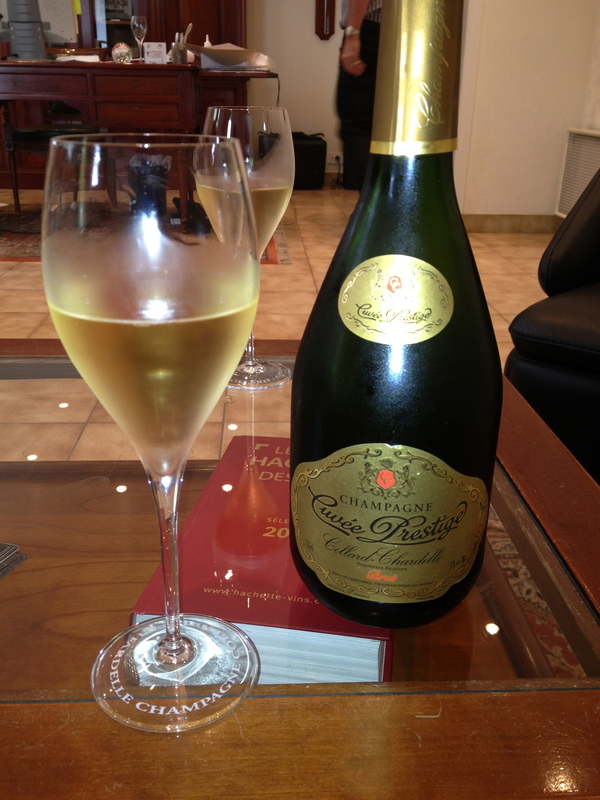 One could still make fine champagne using steel, but it lacked the character, the soul, that oak provides. After a trip by the disgorgement line (where the dead yeast sediment is removed after the secondary fermentation in the bottle), and the view of thousands of bottles stacked on top of one another, we made our way back to the living room/tasting room/office area where the Saveurs was waiting for us. 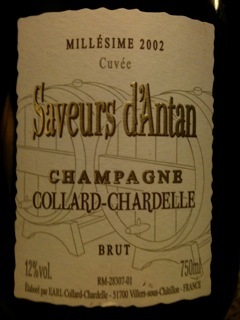 The 2002 Saveurs d’Antan is really something else. Finesse, muscle, elegance, refinement. Really great tropical fruit and that hint of oxidation. I would love to taste this next to a Krug (also aged in oak)–I bet it would hold its own. Incredible. 94-96 Points. As we were making our way through the bottle, we started talking a bit about other wines. Eventually, we ended up in his own personal cellar, with many bottles he inherited from his father (for you wine geeks out there, DRC Richebourg 1929). We got back to the tasting room and he noticed that there was still a bit of the Saveurs left (as in a half of a bottle), and he insisted that we finish it. In the end, I bought a six bottles and strapped them on to my bike. As I did, the sun came out. I think not. Note: Collard-Chardelle is not available in the US (unless you happen to come by our house when we pop one), but his son’s wines, Collard-Picard, are available, which he claimed were exactly the same as his since they were all made together, just labeled differently. 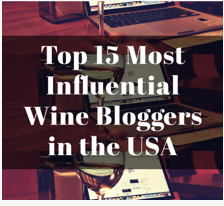 This entry was posted in Champagne, Chardonnay, Cycling, Pinot Noir, Tasting, Tasting Notes, Travel, Wine. Bookmark the permalink. That bike looks pretty old school steel frame. What kind is it? And is it me or does that guy look like a cross between Garry Shandling and Richard Gere? Next summer. You and Boom Boom come on a trip and we will bucket list the hell out of Europe! Do we have to ride? Can we drive the sag wagon? Kind of have to ride…. Now that sounds like a great tasting, and to get a chance to try some wines that are unknown here in the States is even a bigger coup. You will have plenty of friends stopping by at your home, once you get your wine there. Enjoy them, you deserve it, and what a great story. Any time you want to stop by! The wines are here (although we will ikely drink one this weekend…). I will wait for the big wine tasting party you will host in Plymouth. It does sound like quite an experience! Most of it sounds great – except the downhill in the rain part. 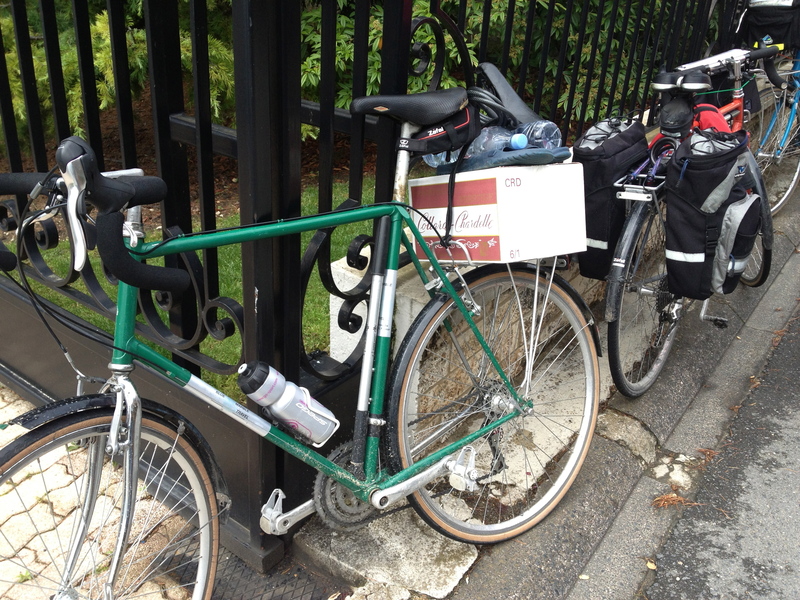 Seeing those bikes loaded with wine makes me think maybe I need to get myself a rear rack and some panniers. Yeah, riding downhill in the rain is not a lot of fun for a host of reasons. I have carried more wine on my bike than I care to admit–even had an “incident” once where a case and a half of champagne fell off the bike. There was no apparent harm to the wine, the bike, or the rider (if you exclude the mental anguish of the entire episode). I feel that Philadelphia gets closer and closer… I really got an urge to visit…some museums? Not! Hop on the train brother! How wonderful! Richard Gary Shandling Gere sounds like a wonderful host, and you must be quite a negotiator. He was such a nice guy, and not bad looking either. I tend to flash the dimples from time to time to get my way…. I hate the sound of scraping styrofoam, too — especially with a plastic spoon. Thanks for another good read! Styrofoam kills me. It’s my kryptonite. So jealous. Except for the bike riding part. Done that. Sold my road bike. I want to live. That is a rather scary comment! Note to self: Not OK to ride in OK….